-A sting from a lionfish is extremely painful to humans and can cause nausea and breathing difficulties. -Its fins have spines that are as sharp as needles. -Considered one of the most poisonous fish in the world. -The lifespan of the lionfish in the wild can be around 15 years on average. -Within the past eight years, the Indo-Pacific red lionfish has spread to the Atlantic and been spotted from the Bahamas to as far north as Long Island, New York! -Lionfish can remain perfectly motionless in water and their vivid vertical stripes and spiny rays allow them to be camouflaged in coral reefs. -They eat just about anything that will fit in their mouth which includes shrimp, small fishes, and crabs. -They will often spread their feathery pectoral fins and herd small fish into a confined space where it can more easily swallow them. -Cannibalism in the red lionfish has been observed. -Maximum size is approximately 15 inches. -Mating involves circling around each other in an almost dance-like fashion. 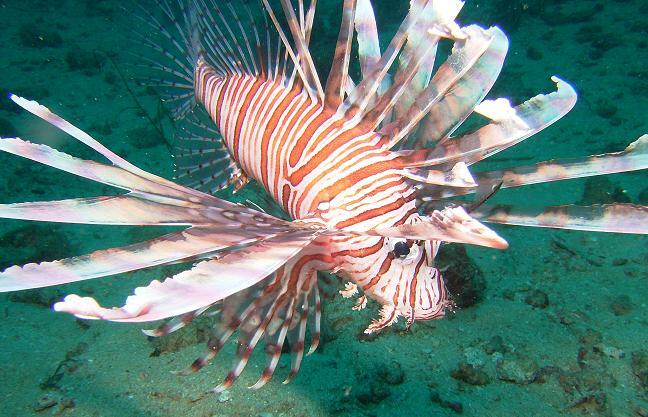 -Lionfish do most of their hunting at night. -It is a prized aquarium fish, mainly due to its spectacular appearance. -Lionfish are solitary fish with virtually no known predators or parasites. -Proliferation of this non-indigenous species could be considered invasive and may cause environmental dangers as well as be hazardous to human beings.